Some administration: I have made statcounter summary counts public, added a privacy page, and will soon add a commenting page. The theme currently does not allow for extracts only. This means the page is long. I am adding google analytics. The theme is now Twenty eleven light, with the correct licence up. FInally, the lectionary is going up most days apart from other things. I do have sermon notes, and need to review and study them: that will end up being an occasional series. I’m using a five year old Mac Pro at work, and windows laptops with Manjaro and Fedora installed on them at home, which are older. I don’t want to spend a lot on laptops: I want one that I can travel with, abuse and when it dies I can get another one… though, to be fair, I don’t break these things. The pinebook is a cool plinking laptop. You can play with it: I have one, and I’ve even managed to get NetBSD running on it, but you would not try to do anything serious on it. But the makers know this, and are making a more powerful device. 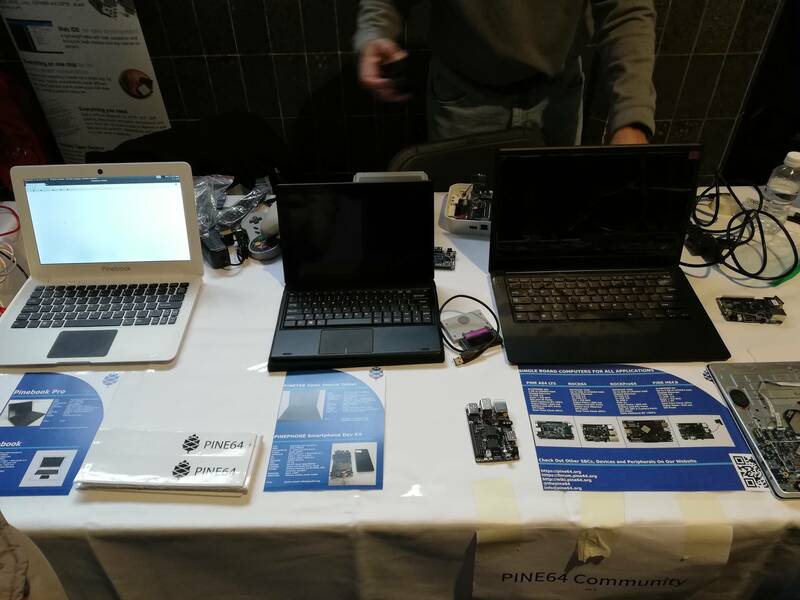 Current Pinebook, Pinetab, and Pinebook Pro (on right) From FOSDEM report, Pinebook. We’ve heard you. Many of you want a high-performance 64-bit ARM laptop that is strictly designed with FOSS in mind and can be used as a day-to-day Linux laptop. Premium materials, great manufacture quality and performance. We’re making it happen this year. Before I let you in on all the details of the Pinebook Pro, let me assure you of two things. Firstly, the current Allwinner A64-based 11.6″ Pinebook isn’t going anywhere and secondly, there will be an upgrade path for owners of the 14″ regular Pinebook to a ‘Pro-like’ Pinebook (we’re exploring an upgrade path for existing 11.6″ users too – stay tuned). The current Pinebook was never meant to be a daily driver – that is to say, it was never meant to replace the laptop you use for work or school. It was meant for tinkering, for learning Linux or *BSD, for development on A64 or ARM in general, as a terminal, a hackable device on-the-go, etc., In my first post on the Pinebook forum titled about the Pinebook – what to expect, I wrote ‘ (…)if you are looking for a device to replace your current work or school laptop then perhaps it’s wise to look elsewhere’. This is not the case with the Pinebook Pro. Bruce Charlton argues that much of academic work is unfree, and the only way to do really good work is unpaid. Matt Briggs dips is pen in acid and writes about the politicization of student evaluation forms. Fortunately, all too often these forms are electronic and not filled in… sloth and disinterest are our allies against the woke cadre of this time. From LInkedin, the most sensible advice I’ve found about coping. On the commercial side, those of us who take photos and process them have to watch Apple. They are going full 64 bit. My workflow is Linux based — primarily Darktable. I can and do install 32 bit libraries if required. Most professionals use Apples, and that will cause problems. The Australians are trying to block Huawei from the pacific cable because they are concerned they make spyware, but the same company is getting contracts for networks here. To be fair, their equipment works… if it is spyware (and I wonder, in my more anxious moments, about the holes the five eyes — US, UK, Austalia, Canada and NZ — have built into routers for years) then ensuring it works matters. As it does to Amazon, who apparently are listening to us via Alexa. It’s not quite enough to make me unplug: but rough drafts and important things should be on paper. That may be able to be stolen, but it cannot be hacked. Admittedly, something like the boring phone might help. There is a tendency to move to open plan. The trouble with this is that if I am interrupted in the flow: of writing, interacting, or developing I lose the “stack” of aspects of the problem I need to consider. Getting into that head space takes time and effort. It only takes one person asking me to do “this one small thing” and I have to start again. Doors rock. For a researcher, programmer, or writer, closed doors are essential. Management, of course, does not know this. But open plan offices are worse. Much worse. Why? Because they decrease rather than increase employee collaboration. As my colleague Jessica Stillman pointed out last week, a new study from Harvard showed that when employees move from a traditional office to an open plan office, it doesn’t cause them to interact more socially or more frequently. Instead, the opposite happens. They start using email and messaging with much greater frequency than before. In other words, even if collaboration were a great idea (it’s a questionable notion), open plan offices are the worst possible way to make it happen. Previous studies of open plan offices have shown that they make people less productive, but most of those studies gave lip service to the notion that open plan offices would increase collaboration, thereby offsetting the damage. The Harvard study, by contrast, undercuts the entire premise that justifies the fad. And that leaves companies with only one justification for moving to an open plan office: less floor space, and therefore a lower rent. The cure for an open office is simple: don’t be there. Work at home, in cafes (headphones on), the library, anywhere that you cannot be interrupted. Hide from your secretaries and Human Resources. If possible, avoid meetings. If you also shut off social medial and mute your phone, you will be more productive. Which brings me to the other distraction of our time social media. Yes, I use it. But when I can’t think that well. I absolutely detest modern “social media”—Twitter, Facebook, Instagram. It’s a disease. It seems to encourage bad behavior. I think part of it is something that email shares too, and that I’ve said before: “On the internet, nobody can hear you being subtle”. When you’re not talking to somebody face to face, and you miss all the normal social cues, it’s easy to miss humor and sarcasm, but it’s also very easy to overlook the reaction of the recipient, so you get things like flame wars, etc., that might not happen as easily with face-to-face interaction. But email still works. You still have to put in the effort to write it, and there’s generally some actual content (technical or otherwise). The whole “liking” and “sharing” model is just garbage. There is no effort and no quality control. In fact, it’s all geared to the reverse of quality control, with lowest common denominator targets, and click-bait, and things designed to generate an emotional response, often one of moral outrage. Social Media are akin to open plan. When you really need to concentrate, switch them off.